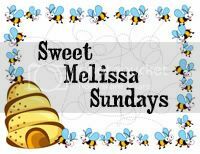 This week's Sweet Melissa Sundays (SMS) recipe was chosen by Donna of L’Amour de Tarte: Chocolate Pie Crust. We were given the opportunity to fill the pie crust with the filling of our choice, using a recipe outside of the cookbook. I've seen chocolate cookie crusts before, but never a chocolate pie crust, so I was curious to try this one. The recipe looked like most pie crust recipes, with the addition of some cocoa powder. Although it's winter, I decided to try an ice cream "pie" recipe that I have had tucked away for quite some time. It was from a Nestle calendar I got in the mail, but you can also find it on verybestbaking.com. I simply used the chocolate pie crust from the Sweet Melissa Baking Book instead of the chocolate cookie crust. I also made my own chocolate ice cream, the recipe for which I'll post later. How did it turn out? Sadly, the chocolate pie crust was a bit of a disappointment. I am not sure if it was just the shortening I used, but the crust had a very strong after taste of shortening that was unpleasant to say the least. 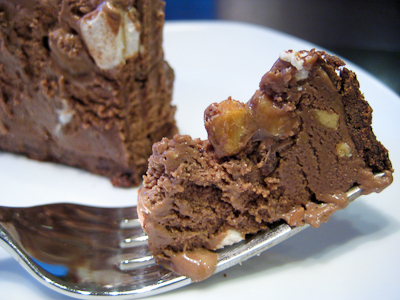 The ice cream pie was great, but next time I need to make sure that I chop my Baby Ruth bars into even smaller pieces (or serve it after just one hour in the freezer) because the candy bits got a bit hard and difficult to eat. 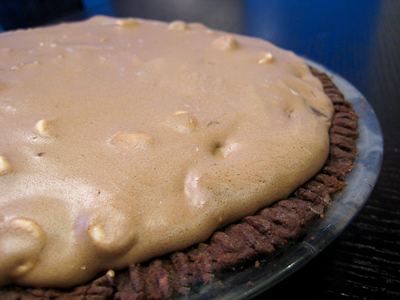 If you would like to try the chocolate pie crust recipe, you can find it here. The Baby Ruth Pie recipe is below (I'd recommend sticking with the cookie crust), and I'll be posting the chocolate ice cream recipe soon. Combine crushed cookies and butter in small bowl. Press onto bottom of 9-inch pie plate; freeze for 5 minutes. 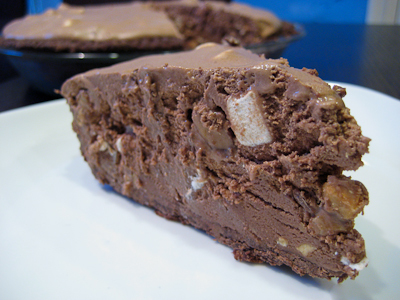 Combine ice cream, chopped Baby Ruth and marshmallows in large bowl; spoon into prepared crust. Freeze for about 1 hour or until firm. Drizzle with Nesquik before serving. Well, it certainly looks delicious! My husband's favorite candy is a Baby Ruth so I'm definitely going to make this for him (and I'll keep your tips in mind)! Oh my gosh that pie looks decadently good!!! I'd love to have a taste.....no a whole piece right now!!!! Yum, that looks amazing. I've never heard of an icecream pie before. Yum! What an amazing pie!! That looks amazing Jaime! I don't think I've ever seen an ice cream pie before. I was disappointed in the crust this week too - mine was bland and the dough was difficult to work with. Yum..I all most made my Frozen Peanut Butter ice cream pie recipe..but decided to go with the turtle pie instead..my pie has oreo crust too...I like it a whole lot better then this crust..it tasted Nasty. Your pie looks so good, I want a slice now! Another winning filling with another losing crust. An ice cream pie sounds like a great idea, even if it is 20 degrees in NYC! I love the name of your dessert and it looks divine. I hope you work on this one some more. It is a great idea for a pie! Well, that looks really good! Seems like we made a chocolate crust for TWD? Maybe not. But not matter where, I seem to remember not liking one I had much then either. Give me traditional. But the pie certainly looks and sounds yummy! Well the pie looks delicious. To bad the crust was a disappointment. On the bright side cookies crusts are so much faster to make now you don't have to decide between the two. although it's a great ingredient, the flavor of shortening leaves A LOT to be desired. i hope it didn't contaminate the pie too badly, as it sounds decadent and delicious! It looks really yummy, so too bad that it didn't turn out as expected. This pie looks so good. My mouth is watering! Have you ever made a pie with a meringue crust? The PW posted a recipe for one on her blog, and I'm intrigued, but a bit scared by the thought of it. I've read a couple of other blogs that said they weren't happy with the crust. Luckily with the filling being ice cream you could easily eat around it. I think this is not low calorie. Looks decadent. Browsing through your blog is making me so hungry!